Concrete has stood the test of time better than any other leading building material. While its strengths are legendary, environmental concerns and sustainable design objectives make concrete an even smarter choice today. Ready-mixed concrete is playing a growing role in green building design and construction because it minimizes the environmental impacts of construction and day-to-day building operation. Buildings with exterior concrete walls utilize up to 40% less energy to heat and cool than similarly insulated buildings with wood or steel-frame walls. Concrete provides superior insulation, air tightness and wall mass to conserve energy. Smaller and more efficient HVAC equipment is required with concrete construction. Concrete’s thermal mass reduces temperature swings. Pervious concrete, supplementary cementitious materials, insulating concrete forms, and recycled concrete like Kuhlman’s “Concycle” recycled aggregate, are just a few concrete-related products available to support sustainable development. Concrete building and pavement systems are complementary to the design concepts and guidelines used in the green building movement such as LEED and Green Globes. Concrete helps achieve LEED certification. Concrete produces no toxic run-off from asphalt sealcoat. Concrete requires less energy to make than asphalt manufactured with expensive and non-renewable petroleum. Concrete structures constructed with Symons Concrete Forms supplied by Kuhlman Corporation benefit from sustainable plywood and recycled steel content. The North American plywood Symons buys is produced from logging in renewable forests following sustainable forestry practices. The recycled content of the steel Symons buys is 90%. The total blend is approximately 70% post-consumer (recycled), 20% post-industrial (recycled) and 10% pig iron (virgin). The amount of carbon dioxide produced during the manufacturing of concrete is relatively small when compared with other building materials. Also, several studies have shown that small quantities of CO2 reabsorb into concrete, even decades after it is placed, when elements of the material combine with CO2 to form calcite. A study appearing in the June 2009 Journal of Environmental Engineering suggests that the re-absorption may extend to products beyond calcite, increasing the total CO2 removed from the atmosphere and lowering concrete’s overall carbon footprint. Concrete’s light color minimizes urban heat islands and reduces carbon footprints. Concrete has one of the lowest carbon footprints of any building material. Concrete’s light color reflects more light at night, reducing lighting infrastructure and energy costs. 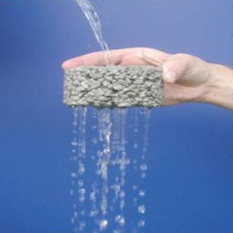 Pervious concrete pavement systems minimize stormwater runoff. Pervious concrete percolates stormwater into soil, recharging aquifers and preventing polluted runoff from overwhelming streams and lakes. Impervious concrete roofs support green landscaping, reducing water runoff and reducing heat island effect. Concrete is produced locally from abundant natural resources. Concrete can be made with reclaimed industrial materials that would otherwise burden landfills. Recycled materials in concrete reduce carbon dioxide emissions. Low-maintenance concrete provides long-term durability. Concrete lasts for decades with fewer repairs. When you want something to last, build with concrete. Concrete structures resist rot, decay, insects and chemicals to provide performance unequaled by other building materials. Solid concrete construction preserves life and property from fire, high winds and hurricanes. Concrete is less expensive over time because it lasts longer and requires less maintenance. Research shows that taxpayers spend significantly less to maintain roads over the lifespan of concrete pavements. Long lasting concrete means fewer traffic delays due to maintenance work, thus saving motorists and businesses time and money, with reduced air pollution from traffic stalled by road construction. At the end of a concrete building or pavement’s usable life, concrete can be recycled. Nearly 80% of recently surveyed parking-lot decision makers believe concrete is superior to asphalt for producing longer lasting lots, according to a 2009 market research survey by the Portland Cement Association. In addition, 62% of decision makers reported that in their area, asphalt has a higher long-term maintenance cost than concrete. According to the survey, current concrete parking lots were considered superior to asphalt for promoting sustainability. The majority of the respondents indicated that concrete has a better appearance, better visibility at night, and lower life-cycle costs, as well as lower lighting costs. concrete building and pavement systems.